What Anne Lamott & Craig Middlebrooks taught me. Ok, so this isn’t Chapter Three, just yet anyways. Y’all, this writing thing is hard. I think that is an ok thing to say. I am sure if you ask the most well known and successful authors they will say the same. I often feel like this task is too much to take on and I don’t have what it takes to do this. But you know what, there is this strong, overwhelming desire to do this. I want to tell this story. I want to tell MY story. I have been thinking a lot about why this is taking me so long to write because to be honest it is one of the most frustrating things to me. I have this story in my head and it’s been there for so long. I have lived these stories in a way. The version of ‘Millie Jo & The Somebodies She Used To Know’ that I had in my brain 10 years ago has evolved because I had to experience moments in my own life. I didn’t know this during those years, yet now it is so very clear to me. Those relationships and life moments in all those categories from the most exciting to what I feel as the most tragic helped me grow. And because of them this story grew as well. The craziest thing to me is that what I feel is slowing me down the most is that I have this fear of people not understanding it, HATING it, criticizing it or what to me seems the worst to me is that they will not care about it at all or even like ME. Yes, I know that sounds pretty narcissistic and slightly emo, but to quote one of my all time favorite TV characters, Craig Middlebrooks from Parks & Rec… “Oh I have a medical condition alright, it’s called caring too much! AND IT’S INCURABLE! …Also, I have eczema.” Well, I don’t have eczema but the rest is SPOT ON. I wish I was brave and just wrote was in my head and my heart, but I have this looming fear floating above my head and I need to get over it, which I wish was as easy as it sounds. The more I have talked to other creators I have learned that this is a totally normal thing to fear. Those quotes like “Nothing worth anything never comes easy” or “If it was easy everyone would do it” seem to always find my Pinterest board and I am like, “ok ok ok, Pinterest I get what you are trying to tell me.” Then days like today I get so motivated to write. I sit in front of my computer, put on my playlist, and then BOOM, there are those thoughts again. What if the people in my own personal life who inspired the wonderful characters think I am some nutty girl who can’t let go of the past? What if the people in my own personal life who inspire the NOT so wonderful characters lash out at me somehow? What of no one is even reading this at all?? Why is it that some of my closest friends or family never talk or ask me about what I am writing? Is this some sort of sign that this actually is a terrible idea for a story and they are just being nice? Should I ask them about it? NO…that would make me sound needy right? Even when I am not writing I am thinking about those questions. All the time. Sometimes I feel crazy and then sometimes it actually inspires me to write more because I want to prove people wrong that I think may be doubting me. It is just this vicious cycle. One time someone said this to me in a text and I saved it. He has had a pretty good amount of success so I held on to what he said. He wrote, “I feel the best advice I can give any writer is to write the most vivid truths, to always write what you feel and don’t be swayed by fear of what anyone may think about it. Write the most brutal, honest, detailed moments of your life, no matter how harsh or painful they may be for you to write or for others to read. That is at least some place to start. The rest just comes out when you least expect it.” What I took from this mostly is to hold true to MY story. It’s not one of vengeance but of someone coming into their own, and being shaped by what she experienced along the way. Some of it’s not pretty, but you know that is life. It’s not all rainbows and unicorns. But here are some truly magical moments in there. 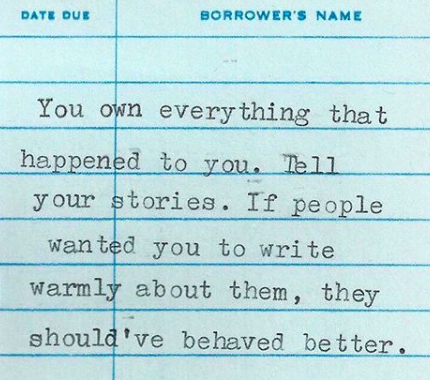 I will forever absolutely LOVE this quote by Anne Lamott.. I guess I am writing this to say, that I hope to be much more productive and much more brave from this moment on. I want to tell the story of Millie. I feel like I owe it to her, and to myself oddly. Maybe not oddly? I don’t know. I do know that I will be disappointed in myself if I don’t give this my all. I can’t let this be another thing in my life I didn’t finish. Maybe it will reach thousands. Maybe it will reach only a handful of people. BUT, I am going to continue on anyway. I hope to make Millie, myself and you proud of me. Thank you for reading that my ramblin’ mind has to say. Ps. You can download the soundtracks to this story via Apple Music & Spotify. Links in menu. Also, please subscribe to get up to date chapters if you would like to continue in this journey with me. Another great way to stay updated is via Instagram. There is also a link for that on here as well. Love you, Mom!!! Thank you for being so supportive ! LOVE YOU!!!!! Love this post. Super important to put yourself out there. Maybe more important to write somethingyou feel you must.